Master Plan Landscapes co-owner and foreman installer, Bob brings 15 years of experience to your landscaping challenge. From small to large landscaping jobs, Bob has managed and installed a wide variety of projects in the Fox Valley and Chilton areas. A Certified Landscape Technician, Bob earned his Associates Degree in Landscape Horticulture & Construction from Milwaukee Area Technical College. Bob is also a Certified Segmental Retaining Wall Installer, plus he has a Commercial Pesticide Applicators License and a Commercial Drivers License. 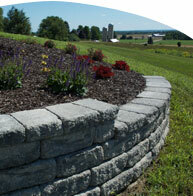 Master Plan Landscape's co-owner, Stacy, has 10 years of experience in every aspect of landscaping. Behind the scenes, Stacy handles the business end of running a design-build landscape company, especially excelling in landscape design, sales, and construction. Known for her detailed and friendly customer service, Stacy earned her Bachelor of Science degree in Landscape Architecture from the University of Wisconsin. The lead designer at Master Plan Landscapes, Holly has 14 years of experience in the horticultural and landscaping business. For 5 years, she has constructed landscapes throughout the Shawano and Green Bay areas, and for 8 years, Holly designed landscapes and honed her customer service skills in the Fox Valley and Green Bay. A Certified Interlocking Concrete Paver Installer, she also has her Vista Lighting Certification. Holly earned her Bachelor of Science degree in Horticulture, with a Landscape Design emphasis, from UW-River Falls.